We've a huge variety of products at Hometown and want you to join us at the shop! After all there's nothing better than feeling the fabrics and putting together your own combinations. That's a large part of the fun is sewing. We've more than 1800 cotton and linen fabrics, including modern and traditional patterns, solids, tonals and pre-cuts. Whatever the weather outside, we have fabrics for all seasons, whether it's Christmas fabrics or deckchair canvas in stock throughout the year. Since summer 2016 we have also started selling more heavy weight fabrics, suitable for home furnishing projects and hope to extend this range further. We order good quality materials from a wide range of fabric manufacturers including Makower, Moda, Cotton+Steel, Dashwood, StudioE, Stof, Sevenberry, Riley Blake and Robert Kauffman. If there is something you think we should sell - let us know! We can cut fat quarters from any of our fabrics, plus we sell off the bolts (the minimum is only 20cm). We also put together our special ten-packs of coordinating fat quarters as shown at the top of the page. 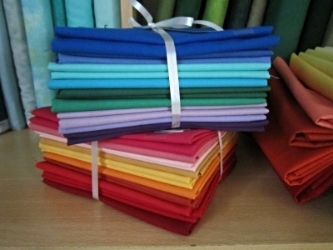 Each selection is a great starter pack for a quilt as it contains 2.5m of fabric. These vary in price between £25-35. For thread geeks we have cotton, recycled polyester and variegated threads. Plus top stitching, perle cotton and stranded embroidery skeins for all your quilting and embroidery needs. Top this off with 10 varieties of wadding, essential haberdashery, lampshade and craft kits and you know you need to pay us a visit! However, if you're not local, just get in touch and we'll pop an order in the post to you. Plus we have hundreds of books covering patchwork and quilting, bag-making, knitting, crochet and children's crafts. Due to the high volume of fabrics that arrive every week we don't have time to constantly update this page. So to see what's new, follow our Facebook and Instagram pages which we update every few days - links at the bottom of the page. Why not ask for Hometown Gift Vouchers as a present? Available in £5, £10, £25 or a combination of these amounts, the vouchers can be used to purchase anything in-store or can be used as payment for a workshop. You can order Gift Vouchers by phone on 01634 838880 and we will post all orders above £10 to you post-free, including a handmade gift card.